In a sign of how quickly the media narrative has shifted from pomp and circumstance to layoffs and bankruptcy, the grim U.S. economy was the overwhelmingly dominant story one week after Barack Obama’s festive inauguration. The financial crisis filled 45% of the coverage studied from Jan 26-Feb. 1, as measured by the Pew Research Center’s Project for Excellence in Journalism. A week earlier, it was Obama’s move into the White House that consumed most of the media’s attention, also accounting for 45% of the newshole, or the time on TV and radio and space in print and online. The economic coverage, which focused on the President’s efforts to pass an $800 billion stimulus package, pushed other news to the sidelines. The next-biggest story, a distant No. 2 at 8% of the newshole, was the Blago-gate scandal—marked by the impeachment of Illinois Governor Rod Blagojevich and his somewhat bizarre TV interview tour. The only other subject to generate a moderate amount of attention was the logistics of the new Administration, where the headlines included two Cabinet nominees—Tim Geithner at Treasury and Tom Daschle at Health and Human Services—hampered by tax problems. Much has been made in the coverage of the historic nature of Obama’s victory. But what may be almost as unprecedented is the urgency with which he has acted on the economic crisis and the press corps’ equally swift pivot from celebrating to legislating. By the end of the week, the media were questioning the efficacy of Obama’s stimulus package, his political clout, and his pledge of bi-partisanship. For all the talk of a media love affair with Obama, the frantic rush of events and the changing tone of the narrative suggest that the new President’s so-called honeymoon may set modern records for brevity. There was a sense of déjà about coverage of the economic crisis last week. Not only did it represent a three-fold increase over the previous week. It also marked the highest amount of coverage of the meltdown in four months, since Sept 29-Oct. 5. That week, the financial turmoil also accounted for 45% of the coverage on the news that after some fits and starts, Congress had passed the initial $700 billion bailout. Last week, the storyline driving economic coverage was the passage, by a party line vote, of the stimulus package in the House of Representatives. It was a reminder media attention is often greatest when it comes to covering the politics of issues in Congress than when those problems were building. The level of attention to the economic meltdown was similar in almost every media sector last week. The low water mark was on network TV (36% of the airtime studied) while cable news devoted the most attention (54%). In between were newspapers (42%), online sites (43%) and radio (48%). Roughly half of the economic coverage was connected to the fate of the stimulus package that started wending its way through Capitol Hill. The stimulus battle moved first to the House and Obama’s very public efforts to engage and woo Republicans generated major headlines about a changing mood in Washington. “It’s a rare day when the President goes to the Capitol to meet only with members of the other party,” noted CBS correspondent Chip Reid. Reid’s story included plenty of doubting Republicans—Minority Leader John Boehner said the bill was doomed by “spending pushed by liberal Democrats.” But the story also conveyed a sense that the White House outreach might pay dividends down the road. “Many [Republicans] commended Mr. Obama for changing the tone and making later compromise possible,” Reid said. Still, stark partisanship became the media theme when the House passed the stimulus package on Jan. 28 without a single Republican vote. That result was depicted even more as a rebuke of the new President because it was unexpected. Questions about the stimulus package were not restricted to the political calculus, however. In a Feb. 1 front-page analysis, David Sanger of the New York Times wondered about possible overreach on the part of the President and his allies. Another staple of coverage of the economic mess has been the tale of infuriating and almost unfathomable corporate greed or excess. Two weeks ago, it was the news that former Merrill Lynch CEO John Thain had spent upwards of $1 million to redecorate his office suite, including nearly $88,000 on a rug. Last week, it was the story that Citigroup, which has received $45 billion in bailout money, planned to spend about $50 million on a corporate jet—an expenditure that incurred the wrath of the Obama team. In a segment labeled “Keeping Them Honest” on the Jan. 27 edition of his CNN show, Anderson Cooper, citing a backlash against the “brazen behavior of banks that messed up big time,” reported that the company had decided against acquiring the new plane. Due largely to his central role in the stimulus skirmishing last week, Barack Obama was the top headline generator, showing up as lead newsmaker (meaning he was the focus of at least half the story) in 16% of all the week’s stories. Next came Rod Blagojevich (7%), who proclaimed his innocence on the airwaves as the Illinois Senate was removing him from office. In another sign of how much media focus was on the White House, Obama’s press secretary, Robert Gibbs, was next at 2%. The No. 4 newsmaker was acclaimed novelist John Updike, who died last week at age 76. He was followed by Michael Steele, the former Maryland Lt. Governor who prevailed after six rounds of voting to become the first African-American chairman of the Republican National Committee. 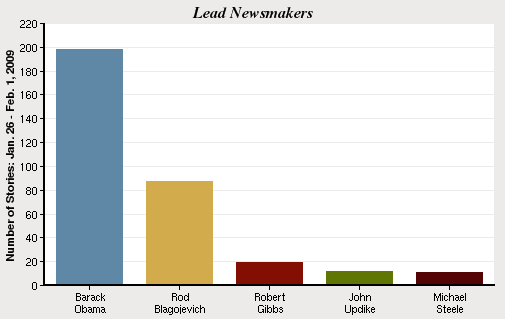 The least surprising development in the Blagojevich scandal last week—which filled 8% of the newshole as the No. 2 story—was the 59-0 vote in the Illinois Senate that removed him as Governor. The most surprising development may have been how many television journalists and personalities clamored to get the disgraced pol on their air. The unbowed Blagojevich protested his innocence on everything from The View to Nightline to Larry King. And the media seemed both repulsed and strangely attracted to him, a phenomenon perhaps best explained by this line in Dana Milbank’s Jan. 27 Washington Post piece. Stories about the new Obama Administration (that did not deal with his handling of major policy questions like the economy) accounted for another 7% of the overall newshole last week. A good chunk of that coverage was focused on two storylines. One was key appointments, with much of the attention focused on Tim Geithner’s eventual confirmation as Treasury Secretary and the tax problems complicating the nomination of HHS Secretary Tom Daschle. (Daschle withdrew from consideration this week.) Another involved media evaluations of the new President, including some discussion of the casual White House dress code that stood in stark contrast to his predecessor’s more buttoned-down style. The fourth-biggest story of the week, at 3% of the newshole, was coverage of run-up to the Super Bowl, which turned out to be one of the better football championships ever played. In the days before the event, an element of the coverage was connected to the economic mess, with reports that some of the usual excess—from lavish parties to stratospheric ticket prices—was being tamped down by the hard times. Rounding out the top-five stories was a nasty winter storm system (2% of the newshole) that wreaked havoc in places like Kentucky and left more than a million people without power. Illustrating just how hard it was to keep Obama out of the headlines last week, a few stories focused on the President’s view that the modest coating of snow and ice that closed Washington D.C. schools would have been barely noticed by the hearty folks in his old hometown of Chicago.